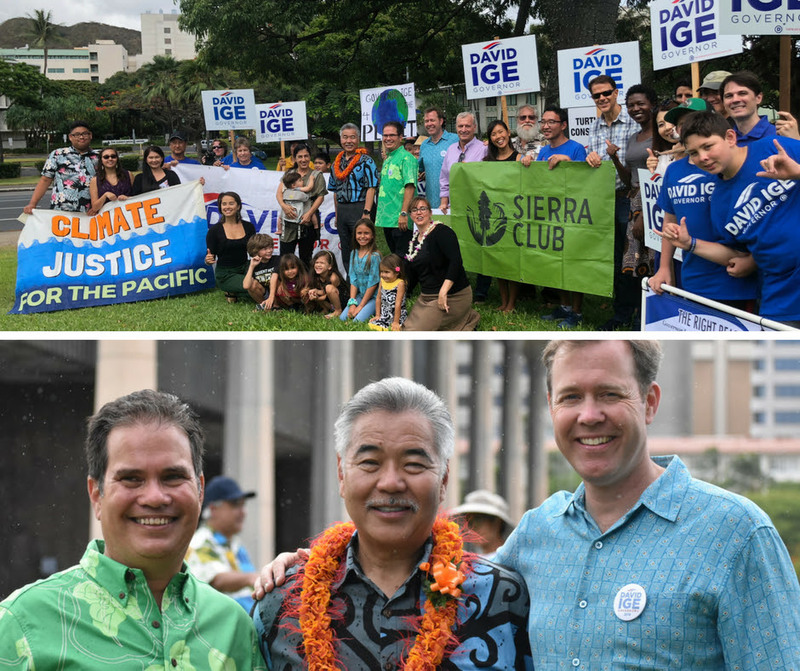 The volunteer leaders announced the sierra Club's endorsement of David Ige on Sunday June 24, 2018 on the Capitol lawn, surrounded by family and friends. Aloha mai kakou. Mahalo for joining us. My name is Jonathan Likeke Scheuer and I serve as the chair of the Political Committee of the Sierra Club of Hawaiʻi. I am very pleased to formally announce the Sierra Club’s endorsement of David Ige for reelection as Governor of the state of Hawai`i (applause). I will just share a few words about how and why we made our decision, before our Chapter Chair Collin Yost speaks. When the Sierra Club endorses a candidate, it represents the final result of a long process. This effort is run by volunteer members who are passionate about electing environmental champions, and we make decisions guided by national and local rules. Our committees, made of elected and appointed club members, draft and send out questionnaires and interview candidates. We review the candidate's records, and have full discussion before voting to make an endorsement. The Club appreciates the commitment to public service and the environmental concerns of all the candidates in this competitive race. Nonetheless, we are unified and clear in our belief that Governor Ige offers the best leadership for Hawai`i in these times of enormous environmental and political challenges, here in Hawai`i and across the US and the world. Governor David Ige is the exactly the kind of leader Hawaii needs right now. We are painfully aware that on the national stage, we have leadership that values style over substance, reaction over deliberation, opinion over fact, and and aggression over compassion. Governor Ige provides the necessary counter balance to these efforts that tear at the fabric of our national and local society. He embodies our local value that one can disagree without being disagreeable. Beyond style, on local, national, and global issues, David Ige has raised the bar. Instead of passively waiting for courts to decide on issues, his administration has successfully resolved long standing and difficult water disputes on West Maui and Kaua`i. He has stood up to offshore capital that would move us away from our shared renewable energy goals, as seen in the rejection of the NextEra bid for Hawaiian Electric. He has committed himself to protection of our marine resources and overseen the creation of community based subsistence fishing areas. Finally, he has led efforts to help Hawaii`i adapt, in the near and long term, to the inevitable and deeply disruptive impacts of climate change that will challenge Hawaii for generations to come. David Ige has raised the standards of good and open government and has proven he is up to leading us to face the environmental challenges ahead. He deserves four more years to continue the job he has started and we are honored to stand with him and endorse him for reelection. Aloha. I'm Colin Yost, and I serve as the Chair of the Sierra Club of Hawai'i's Executive Committee. Hawai'i is our paradise, but that paradise will disappear in our lifetimes unless we take aggressive steps to reverse and mitigate the danger of climate change. A changing climate is in fact the greatest threat to our economy, our environment, our food supply, our homes and our health. Governor Ige doesn't wear a cape and tights to work, but he is a man of action when it comes to fighting climate change. He blocked an aggressive mainland effort to replace our dirty oil burning power plants with only slightly less dirty gas burning power plants. Powerful interests opposed David Ige in all of his efforts – interests that value short term profit over Hawai'i's long term security. But Governor Ige never once backed down. For his dedication to the public interest and for his determination to do what's right for Hawai'i's future, David Ige deserves our support and our votes. With that, I am very pleased to introduce our current and future Governor, David Ige.